Located in the village of Palmyra located at mile marker 253 on the Erie Canal, Historic Palmyra is a must see on any trip within the Erie Canal Corridor. With 5 museums within easy walking distance from Palmyra’s Marina, Palmyra has been a vital community throughout the history of the Erie Canal, and is as important today as it was 200 years ago. Welcome to central New York! We’ve got lots of great activities planned for you, so let’s hit the ground running. Day One: Your first stop is the No Excuses Tour of downtown Syracuse. This tour will deliver an engaging, fun experience. 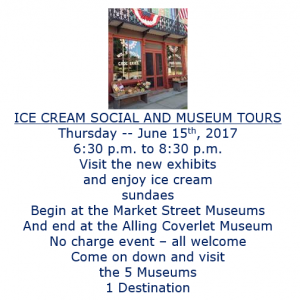 You will explore the history, architecture and food of downtown Syracuse. Your second stop is the Empire Brewing Company to enjoy some light fare and a beer tasting. The Empire Brewing Company doesn’t just make great tasting beers and ales – they also believe in the idea of “Eat Where You Live” and really go the extra mile towards sustainability via composting, using green products, and recycling. Next, you’ll visit Clark Reservation State Park. Formed during the last ice age, the park features almost every geological feature you can think of- cliffs, meadows, woodlands, and a glacial plunge basin lake. All that hiking works up an appetite! A trip to the Syracuse Suds Factory will help take the edge off with some dinner and local craft beer. After dinner, you’ll visit The Funny Bone to take in a comedy show to end your first day with a laugh. You’ll be staying at the Jefferson Clinton Hotel, another locally owned eco-friendly business. A good night’s sleep leaves you ready for day 2 at a local hotel, B&B, Inn or air B&B of your choice. After a morning of time on your own, you’ll be ready for lunch at Modern Malt, a unique spin on the classic American diner. You’ll need some fortification before your afternoon activity – hiking with llamas! The llamas will carry some snacks and drinks to enjoy at the end of the trail. Llamas notwithstanding, hiking is thirsty work. A stop at the Beak and Skiff, a local cider distillery, will quench your thirst with some fresh cider. You might want to try a fresh apple cider donut – one of the tastiest treats in the world. Now you’re off to Utica! First, you’ll visit the Chittenango Landing Dry Dock Complex for some bike riding along the Old Erie Canalway. All that fresh air and pedaling will get you ready for dinner at The Tailor and The Cook, Utica’s premier farm-to-table restaurant (you’ll want to try the Jones Family Farm Cheesecake!). You’ll be staying at the Rosemont Inn, an immaculately restored Italianate B&B in the heart of Utica. After a delicious home-made breakfast, it’s time to hit the trail at the local arboretum, the Hamilton College Root Glen Arboretum. Started by the distinguished local Root family, this garden has grown since 1850 into the masterpiece you see today, owned by Hamilton College and featuring 65 species of trees, shrubs and flowers. Lunch will be served at the Nail Creek Pub & Brewery, serving craft beer since 2008. Speaking of beer, you’ll be visiting the FX Matt Brewing Company in the afternoon. Family owned since 1888, it’s the fourth oldest family-owned brewery in the United States. After a tour of the brewery and a pint in the 1888 Tavern, it’s a quick walk across the street to ADK Distilling for a tour and a tasting of ADK Vodka – an international award winner! Next you’ll visit Woodland Beer, a hop farm and craft brewery in Marcy, NY. Enjoy some pints or flights and visit the on-location food trucks for a fun end to a busy day. We know you’ll remember this as a vacation of a lifetime in Central New York! Authentic 1830’s bookstore, bindery and print shop. Check in to Palmyra Inn, Liberty House Bed & Breakfast or Canal Town Bed & Breakfast. 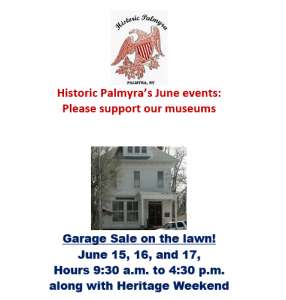 Stroll through the Village of Palmyra and visit some of the great antique and specialty shops. Lock 29. Wetlands were formed in the excavations of the original Erie Canal. State Clocks in the country. Peppermint Cottage Bed & Breakfast in Lyons. Attached and learn the stories of the inmates. Have dinner in Lyons at Bone Appetit BBQ or Growler’s Pub & Grill. Return to your overnight accommodations. Restored freshwater marshes, two-miles and trails, and an all-access observation platform.